- Belles near Easton, Pa.
Click here for photos of the Kvarnbergs. Mats, born in July 1678. Anders, born in April 1680. Little is known about Anders and Anna at this point because the birth records of Gagnef parish start in 1694 and the household registers start in 1730. (1) Information about Anders Mattson and Anna Olsdotter is contained the death records of their sons Mats and Anders, in Gagnef church books F:3, images 192 and 125 in the records available through ArkiDigital, at www.arkivdigital.net. The death in 1691 of an Anders Matson, age 52, is recorded in Gagnef church book EI:1, page 103. However, it seems unlikely that he was the father of Matts and Anders since he does not appear to have lived in Gagnefsbyn. Anders, born Nov. 26, 1705, and died in December 1705. Anders, born in Jan. 28, 1707. Anna, born June 11, 1709. Olof, born Nov. 19, 1711, and died Nov. 26, 1711. Marit, born Feb. 2, 1714. Olof, born March 1715, and died April 10, 1715. Margrita, born Sept. 30, 1718, and died Aug. 9, 1724. Mats, born May 22, 1716. Olof, born March 23, 1723. Pehr, born Dec. 1, 1731. Margrita had two other children. According to her death record, she gave birth to eight sons and six daughters, but only four sons and four daughters survived. However, Anders’ death record says he was the father of nine sons and five daughters. Anders and Margrita spent their entire lives in Gagnefsbyn, where Anders was probably a farmer. Margrita died in 1739 and Anders died in 1749. (1) Anders’ birth information and much more about his live is recorded in his death record in Gagnef church book F:3, image 125 in the records available through ArkiDigital, at www.arkivdigital.net. (2) The marriage is recorded in Gagnef church book EI:2, page 73, which mentions it occurred on the 21st Sunday of Trinity in 1704, which probably fell in late October. Margrita’s birth information are mentioned in her death record in Gagnef church book F:1, image 82. The record says she was born during Michael’s tide, which would be around the end of September. (3) Some of the children’s births are listed in the household register covering 1730-1775, which is in Gagnef church book AI:1, page 297. In addition, the following births are also recorded in church book C:1: first Anders, page 44; second Anders, page 54; Anna, page 67; the first Olof, page 82; Marit, page 99; Mats, page 116; Margrita, page 132; Kiersten, page 151; the second Olof, page 159. Pehr’s birth is recorded in book C:2, page 32. Children’s death are recorded as follows in book EI:2: the first Anders, which occurred around the fourth Sunday in Advent, is on page 37; the first Olof, page 46; the first Margrita, page 62. In addition, the death of the second Olof is recorded in book EI:2, page 51. I did not see a baptismal record for him but might have missed it. 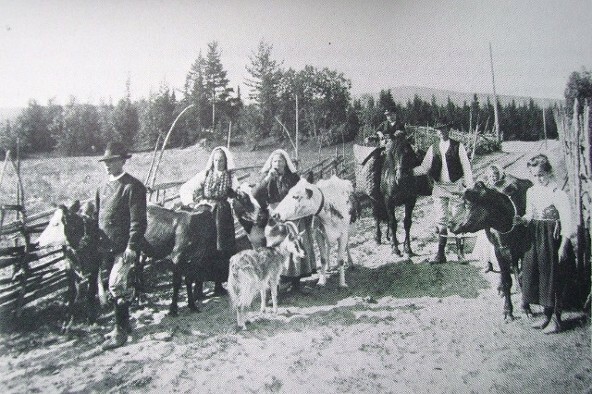 Residents of Gagnef, Sweden in 1911. Click here for more Kvarnberg photos. Margrita, born Aug. 11, 1735, and died Aug. 17, 1735. Anna, born Sept. 11, 1737, and died before 1744. Anders, born Aug. 27, 1738, and died in 1740. Kiersten, born Aug. 8, 1741. Anna, born Nov. 11, 1744. Jons, born Nov. 5, 1749. Died in 1752. Margrita, born July 24, 1752. Died in 1758. Matts, born in July 14, 1755. Died in July 1755. Matts, born May 16, 1757. Died in 1758. At some point between the birth of Anna in 1744 and that of Anders in 1747, the family moved to the household of Anders’ father in Gagnefsbyn. They appear to have remained there the rest of their lives. Most of Anders and Anna’s children died very young. Two of the children, Matts and Margrita, at the same time in 1758 during what appears to have been a widespread outbreak of “blodsot,” a term that’s usually used to designate dysentery. Margrita died in 1739 and Anders died 1749. (1) The birth is listed in Gagnef church book C:1, page 54. (2) The marriage is recorded in Gagnef church book EI:2, page 89. It says that Anders was from Gagnefsbyn and Anna was from Överbacka. Anna’s birth is recorded in Gagnef church book C:1, page 125. (3) The children’s births and Jons’ death are listed in the household register covering 1730-1775, which is in Gagnef church book AI:1, page 297. In addition, the following births are also recorded in church book C:2: the first Anna, page 63; the first Anders, page 67; Kiersten, page 82; the second Anna, page 94; the second Anders, page 108; Jons, page 124; the second Margrita, page 142. The first Margrita does not appear to have been baptized, but her death is recorded in book EI:2, image 29 in the records available through ArkiDigital, at www.arkivdigital.net. The death of the first Anders is recorded in book F:1, page 141. The 1758 deaths of Margrita and Mats are recorded in the same listing in book F:4, page 101. (4) The household register is in Gagnef church book AI:1, page 261. Anna, born Sept. 6, 1772. Died Sept. 27, 1772. Brita, born June 12, 1774. Died in 1776. Carin, born April 6, 1777. Anders, born Oct. 31, 1781. While Anders was head of the household in Rista, the designation “Qvarnsveds” was added before his name in church records. This appears to have started a little after 1802 because the household registers that cover 1802-1817 actually have “Qvarnsveds” added above Anders’ name. (5) It seems likely that the designation derived from the name of his farm. About this time, true surnames were used only by families in Sweden’s nobility, military and clergy, as well as many in the largest cities, like Stockholm. Most Swedes used the patronymic naming system, under which children’s last names were a combination of their father’s first name and either “son” or “dotter,” depending on the child’s gender. It seems likely that officials in Gagnef had noticed the huge number of Anders Andersson in their parish and decided something was needed to differentiate them. For example, the village of Gagnefsbyn had 17 households listed in the parish registers for 1730-1775 and they contained 11 Anders Anderssons. Starting in the early 1800s, many of the families in the area – though not all – started acquiring unique additions to the beginning of their names. Most male members of this family were to be known as Qvarnsveds for the next few generations. It seems to have changed only after members of the family moved to another location within Rista. (1) Birth is listed in Gagnef church book C:2, page 108. Transcripts of records that were supplied by the Gagnef Pastorate (Pastorsambetet i Gagnef) in the late 1980s indicate that Anders was born July 28, 1747. However, the only Anders born to an Anders (hence Andersson) in Gagnefsbyn during 1747 was born on May 30. Gagnefsbyn was a very small village and, although several men were named Anders Anders, none of the others was born in 1747. In addition, Anders’ death record lists his birth date, and parents, in church book F:7, image 12 in the records available through ArkiDigital, at www.arkivdigital.net. (2) The marriage is recorded in Gagnef church book EI:2, image 111. Carin’s parents and birth date are identified in her death record in Gagnef church book F:7, page 195. (3) The children’s birth and death dates are listed in the household registers that cover 1750-1775 in Gagnef church book AI:2, page 118, and those that cover 1775-1791 in book AI:4a, page 73. (4) The transition to Anders Andersson is indicated in the household registers that cover 1792-1801, page 71. (5) The household register is in Gagnef church book AI:12, page 90. (6) Anders death is recorded in church book F:7, image 12, as noted above. Carin’s death is recorded in Gagnef church book F:7, page 195. Anders, born Oct. 18, 1802. Per, born Sept. 30, 1806. Olof, born Dec. 22, 1812. Carin, born April 24, 1818. The designation “Qvarnsveds” preceding Per’s name was probably an indication of the farm where he lived. It was added to the names of most male adults in the family starting in the 1810s. In the marriage record, Per is listed as a “dräng,” or farm hand. Anders continued to live on his father’s farm after the marriage and seems to have inherited it after his death in 1824. The household registers for 1826-1835 indicate that Ander’s mother lived in the household at No. 1 Rista until her death in 1834. Kerstin died in Dec. 24, 1847. (6) Kerstin’s death record indicates that she gave birth to six children. Two apparently died at birth since they don’t appear in the household registers. (1) Gagnef church book C:4, page 39. (2) The dates of the children’s births are listed in the household register that covers 1818-1825 in Gagnef church book AI:15, page 175. However, only the month of December is indicated for Olof. The date for him is found in the 1826-1835 registers in book AI:17, page 178. (3) The marriage is recorded in Gagnef church book EI:3, page 40. Many later household registers indicate the wedding occurred in 1801, possibly because that’s when bans were published to announce the wedding. Kerstin’s birth is recorded in book C:3, page 113. Her name is spelled a number of different ways over the years, including Kiersten at birth and Cherstin in many cases. (4) Gagnef church book F:7, page 217. (5) Gagnef church book AI:23b, image 6 in the records available through ArkiDigital, at www.arkivdigital.net. (6) Gagnef church book F:7, page 355. Anders, born Oct. 6, 1825. Mats, born Dec. 5, 1827 and died Oct. 6, 1830. Per, born Dec. 31, 1829. Kerstin, born May 29, 1832 and died in 1839. Mats, born Jan. 13, 1835 and died in 1838. Karin, born Dec. 30, 1836 and died in 1838. Karin, born Jan. 20, 1839. Olof, born Dec. 13, 1848. Mats, born March 20, 1852. In the marriage record, Anders is listed as a “dräng,” or farm hand. The family lived in Rista, where Carin gave birth to seven children. However, four of them died very young, including three during the years 1838 and 1839. The designation “Qvarnsveds” preceding Anders’ name was probably derived from the farm where he lived. It was used in his first marriage record, when he still lived in his father’s household. However, for many years after his marriage, Anders didn’t use the designation, possibly because he had moved out of his childhood home. It seems that Anders established his own home on a corner of his father’s property in Rista. The household registers that cover 1818-1825 and 1826-1835 list the family of Anders Andersson – without “Qvarnsveds” – at the bottom of the page containing his father at No. 1 Rista. It seems likely that this separation was enough to prompt the dropping of “Qvarnsveds” from his name. In the registers for 1836-1845, Anders appears as the head of a new household designated No. 3 Rista. In the next set of registers – those that cover 1846-1857 –Anders finally reacquired the designation “Qvarnsveds.” However, even then, it was apparently a later addition because it appears above his name rather than before it. (1) Gagnef church book C:4, page 145. (2) The births and deaths of the children are recorded in the household registers for 1826-1835, in: church book AI:17, page 178: and for 1836-1845 in book AI:20, page 188. (3) The births of the children are recorded in the household registers for 1846-1857, in church book AI:23, image 8 in the records available through ArkiDigital, at www.arkivdigital.net. (4) The marriage to Carin is recorded in Gagnef church book EI:3, page 98. Carin’s birth is recorded in church book C:4, page 123. (5) Carin’s death is recorded in Gagnef church book F:8, page 22. (6) The marriage is recorded in Gagnef church book EI:4, image 19 (ArkiDigital). Johanna’s birth is recorded in book C:4, page 215. (7) The 1858-1867 register listing is in Gagnef church book AI:26, page 234. (8) The 1868-1877 register appears in Gagnef church book AI:29, page 300. (9) Gagnef church book AI:32, page 375. (10) Gagnef church book, F:10, page 116. (11) Gagnef church book, F:10, page 143. Karin, born Dec. 15, 1853. Anders Qvarnberg, born Dec. 27, 1855. Per Qvarnberg, born Sept. 18, 1858. Olof Qvarnberg, born April 25, 1864. Anna, born March 26, 1868. The designation “Qvarnsveds” preceding Per’s name was probably an indication of the farm where he was born. It was used to identify him in every record, even after he married and moved away from his father’s farm. That move, though only to a different part of Rista, seems to have prompted a change in the family’s name. Per’s children were given the surname “Qvarnberg,” which would be literally translated as “mill mountain.” After the Swedish spelling reforms of 1906, the name became Kvarnberg, which is used by descendants in America and Canada. At the time of his marriage in 1853, Per is listed as a “dräng,” or farm hand. In 1890, Per is listed as a landowner. In addition to his wife Anna, his household contained their daughter Anna and their son Olof, as well as Olof’s new wife Anna Olsdotter and their young son Anders, who had been born that year. In 1900, Per appears to be living alone and whatever occupation was noted in the record has been erased. (1) Per’s birth is recorded in Gagnef church book C:4, page 375. (2) The marriage is recorded in Gagnef church book EI:4, page 29. Anna’s birth is recorded in Gagnef church book C:3, page 355. An unpublished Kvarnberg genealogy compiled by members of the Kvarnberg family in Canada says Anna was born April 7, 1828. (3) The birth dates are listed in the household register for 1868-1877, which appears in Gagnef church book AI:29, page 301. (4) Swedish census records are available through the Swedish state archives. (5) Her death is recorded in Gagnef church book F:12, page 18. (6) His death is recorded in Gagnef church book F:12, page 126. Anders, or Andrew, born Dec. 22, 1890. Olof, born Sept. 11, 1892. Anna, born Jan. 18, 1895. Married Evald Monson. Kerstin, born Feb. 13, 1897. Erik, born Sept. 5, 1900. Gustaf Edvard, born March 18, 1903, and died April 20, 1903. Karin, born Sept. 23, 1905, and died Feb. 6, 1906. Gustaf Edvard, born Oct. 8, 1906. In the 1890 census of Sweden, Olof, his wife Anna and their young son Anders are listed as living in the same household as Per in Rista. Olof is listed as a “dräng,” or farm hand. In the 1900 census, Olof is listed as a “jordarbetare,” or agricultural worker in Rista. The Kvarnbergs were very poor, according to their son Gustaf. They lived on a rundown farm, which they didn’t own. Things got worse after Olof’s wife died of tuberculosis on May 19, 1908. (4) Olof was rarely home because he worked long hours at a sawmill. The 1910 census shows the widowed Olof and his children living in the home of his father-in-law Plåt Olof Olsson in the village of Graf. He is listed as a worker in a sawmill. About this time, the children started immigrating to the United States seeking better opportunities. Anders – known as Andrew in America – left Sweden on March 8, 1909. Olof – often spelled Olaf in America – left on Oct. 9, 1911 and served in the U.S. Cavalry in the Southwest in 1918 and 1919. (Family members insisted he was part elf because he had pointed ears.) Anna and Gustaf left together on July 20, 1913. Family tradition says Kerstin and Erik came in 1919. However, Gagnef church records say Erik left on Dec. 28, 1916. The records say Kerstin first moved to Stjarnsund on June 6, 1917. They don’t say when she left for America. (1) Some this information was obtained through interviews with Gustaf Kvarnberg in 1989. Olof’s birth is recorded in Gagnef church book C:7, page 9. (2) The marriage is recorded in Gagnef church book C:7, page 33. Anna’s birth is recorded in book EI:5, page 44. An unpublished genealogy compiled by members of the Kvarnberg family in Canada says Anna’s last name was Dragsten and she was born Aug. 2, 1866. (3) The records of the Kvarnbergs’ births, marriage, immigrations and deaths were in church records obtained by writing to the Gagnef Pastorate (Pastorsambetet i Gagnef) in Sweden in the late 1980s. These are also now available online through the Swedish state archives at www.svar.ra.se. The Kvarnberg genealogy says Andrew was born Dec. 23, 1890. (4) Her death is recorded in Gagnef church book F:12, page 158. (5) Olof’s death is recorded in Gagnef church book F:12, page 238. The Kvarnbergs had three children. Before Gus left Sweden, an old man told him that America was a magical land. Americans road in carriages that weren’t drawn by horses, but were controlled by moving a stick. Of course Gus had never seen an automobile and thought the man was some kind of psychic when he first saw a car. Young Gus thought the voyage across the Atlantic would never end. The passengers were allowed on deck only once a day to exercise and Gus suffered from bedbugs. In 1989, Gus recalled that he was amazed by the large buildings he saw in the United States. He also remembered that flowers and shrubs adorned Ellis Island. “It looked like a paradise,” he said. “I thought, ‘This is where I want to stay.”’ However, Gus suffered from lice during his stay on the island and was eager to leave when the time came. Ellis Island, in New York Harbor, acted as the main receiving station for immigrants from the 1890s to the mid-1900s. Immigrants were registered and examined for disease before they left the island. When he began school in Chicago, Gus said, he couldn’t speak any English. He felt embarrassed and became determined to learn the language. Later in life, he remembered little Swedish and spoke with no accent. Gus spent the next two decades living with various relatives. Gus said he spent his first three years in the United States living with his aunt and uncle, Peter Sundquist. Gus then moved in with his brother Andrew and later lived with his sister Anna and her husband, Evald Monson on a farm in Rice Lake, Wis. While he was young, he was treated unkindly at times. In the 1920 Census, Gus appears in the household of his brother Andrew, at that time a farmer in Meteor Township, Sawyer County, Wis. Gus is listed as a 13-year-old alien who was born in Sweden. He was listed as attending school and able to read and write. However, Gus said he left school after eight years. Gus held several jobs in his youth, including one as an errand boy for Brooks Laundry in Oak Park, Ill. He also worked in this brother Andrew’s butcher shop on the west side of Chicago. In this job, he would wear roller-skates when making deliveries. Gus was naturalized when he was 19 years old. The 1930 Census shows Gus living with his brother Andrew in North Muskegon, Mich. It indicates that Gus was working as a meat cutter in a meat market. It was about this time that Gus met his future wife, Olga Evelyn Larson. During Olga’s vacation in 1930, the pair met at a bonfire social in Twin Lakes, Mich. An older man picked up Olga and carried her over to Gus and dropped her into his lap. On Oct. 9, 1935, Gus and Olga were married in Chicago. On their wedding day, Olga’s father broke his arm but didn’t tell anyone until the next day because he didn’t want to ruin the festivities. Olga was born April 19, 1913, in Chicago to Otto and Bertha Christine (Wiberg) Larson. Olga said she dropped out of high school after becoming ill and missing most of a semester of classes. However, she went to business school to learn secretarial skills. She then got a job with Mutual Trust Life Insurance Co. in Chicago, earning $10 a week. Olga earned a high school equivalency diploma in the early 1960s. After they married, the Kvarnbergs settled in North Muskegon, where they provided a nice middle-class atmosphere for their children. The 1940 Census shows the family living on Ruddiman Avenue. It says Gus was a manager in a retail meat and grocery market. Gus enjoyed woodworking and building things. Gus did most of the finishing work on his house in North Muskegon, Mich.
“He was very creative in rigging up all sorts of things to make life easier,” their daughter Grace wrote in 2013. “During WWII he made Don and Grace a playhouse. This play house was a hospital, fort, school, house, etc at various times. It was a favorite thing for all the neighborhood kids. He also made a scooter out of scrap wood and old roller skates ... another favorite toy for the whole neighborhood. Gus also built doll furniture for his daughter and a cradle for his granddaughter, Ingrid (Fries) Bowers. When Gus was younger, he played the violin. The violin was eventually passed down to his great-granddaughter Alexandra Bowers, who played it when she was in elementary school. Olga enjoyed maintaining Swedish traditions, such as serving lutefisk for Christmas, and she and Gus belonged to the Vassa Lodge, a Swedish organization. Both were active at Samuel Lutheran Church, where Gus served as financial secretary for 22 years. They were also volunteers at Hackley Hospital in Muskegon. Gus died Jan. 11, 1992. Gus and Olga are buried at the North Muskegon cemetery in Laketon Township. (1) Information comes from a questionnaire and interviews with Gustaf and Olga Kvarnberg in 1989 and notes from their daughter Grace Reishus in 2013. Records of Gus’ birth are in Gagnef church book C:11, page 67. The birth record spells Gus’ name Gustaf Edvard Qvarnberg. (2) Her death is recorded in Gagnef church book F:12, page 158. (3) Olof’s death is recorded in Gagnef church book F:12, page 238. (4) Their departure is recorded in Gagnef church book BI:4, page 84. (5) Copies of the letter has been passed down through the family. (6) List of passengers arriving at Ellis Island on Aug. 16, 1913, available through www.ellisisland.org. (7) Gus’ obituary clipped from an undated, unidentified newspaper. (8) Olga’s obituary clipped from an undated, unidentified newspaper.